Okey dokey, this is the one that started it all. Journalling has always been a really big deal for me and divorce is a big deal too. For me, it was the seventh best thing that has ever happened in my life (says the lady with 6 kids). Whenever I hear about women feeling sad and stressed about their divorce, I just want to hug them. I never had a single minute of regret or sadness about my divorce. Don’t get me wrong, I was depressed for years at the end of the marriage as little by little, I slowly realized that I didn’t really have one. 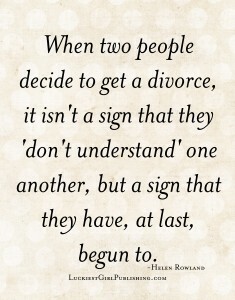 One of my favorite quotes from this book is “When two people get a divorce, it isn’t a sign that they ‘don’t understand’ one another, but a sign that they have, at last, begun to” by Helen Rowland. This book is packed with quotes that are specifically chosen to help stimulate your mind and begin to look at the positive aspects of divorce, in order to move on with dignity. It was easy for me to be at peace with my divorce instantly, our core values were so different that “being me” was just impossible. Every move I made and every word I said was wrong. I begun to realize that my dreams of a happy future couldn’t possibly include him, the life he wanted was so different from anything I wanted and the life we had built was so unhappy. I wanted peace, financial stability and emotional safety. Once I realized that the only way to get it was to make a run for it, I severed the connection in my heart long before papers were served. It was the best decision I have ever made. We now have a peaceful, happy home. It was so worth it. But this isn’t about me, this is about the journal. 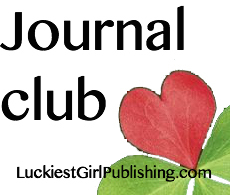 Behold, the very first published journal from Luckiest Girl Publishing. Divorce is officially my beginning.